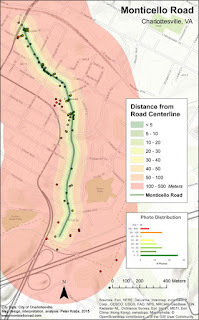 Monticello Road: Where are the Pictures? My first question was whether the fact that I live in the neighborhood influences where I choose to photograph—do they tend to cluster around my home? 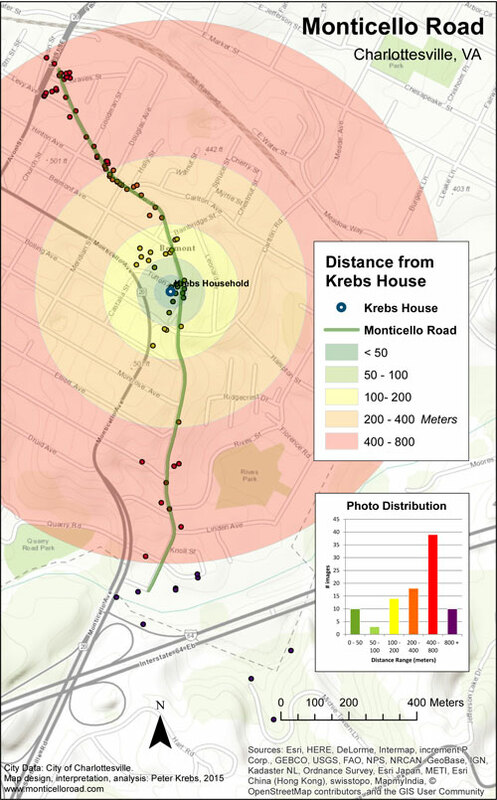 There appears to be a small but not particularly significant bias around my house (assuming a fifty meter circle) but most of the images are at least a quarter mile away—and remember the road only extends about half a mile in either direction so that indicates some (but insignificant) clustering near the house. 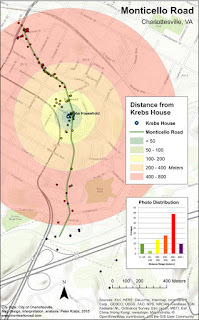 Next, I wanted to know how much, from a spatial perspective, the road organizes the project. Were the photos primarily taken on the street (within 5 meters of the centerline)? Sidewalk (5-10 meters)? People’s yards/terraces (10-20)? Within at least a block (100 meters)? 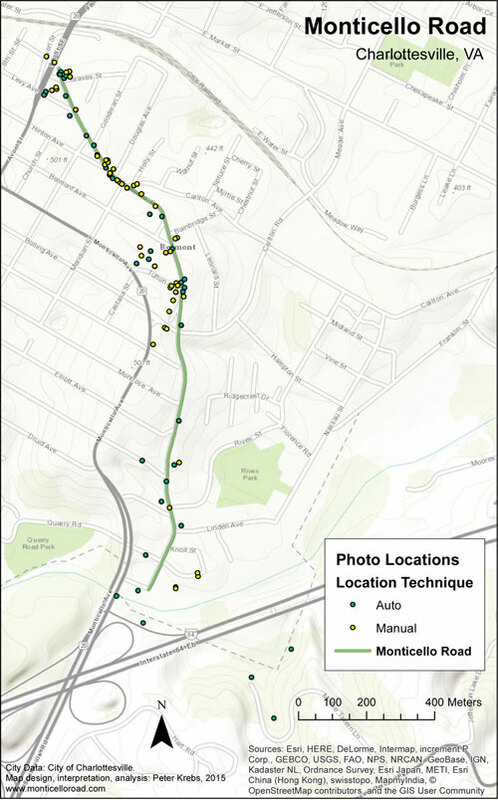 As is plainly visible in both the map and the chart, a strong plurality of images were captured on the street itself and a vast majority within a single block. I could see on the Ring Buffer map that there were visual clumps of images and I wanted to know what gravitational force was pulling them together. I postulated that they might be businesses or gathering places where I spend time. I mapped several of these enterprises with the address locator. Next I ran a kernel density tool and could see that indeed the nodes do cluster around businesses that I frequent. Going into the project I was concerned that I would pay less attention to areas south of my home because they’re not on my way into town. 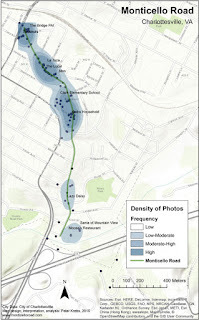 The second learning from the density analysis is that it is somewhat true but I do also frequent businesses to the south, so while convenience is a factor, so I also seem more comfortable spending time in restaurants and cafes, where I can sit (as opposed to open patches of sidewalk). 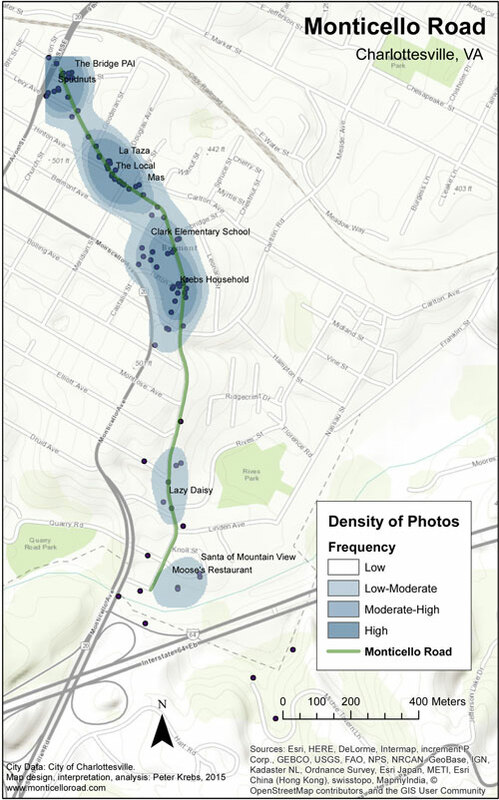 Note that the only park on the route (the Clark playground) is a strong node, as well as the informal (and now ex-) open space explored in the previous post. 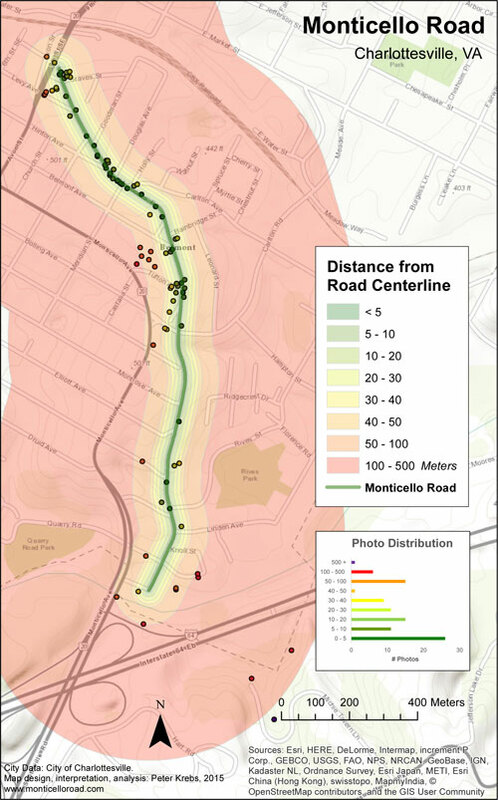 The Monticello Road project explores the intersection between people and place so if the pictures capture moments of interaction, these maps track where they take place. 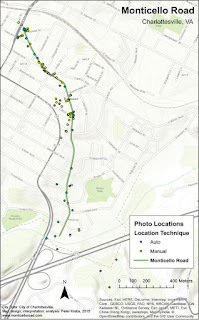 Because the project is organized around a roadway, it is not surprising the photos happened on or near the right-of-way. We can see that it is a linear social space and that is an asset beyond transportation. We can also see periodic nodes where interaction is concentrated. They are spread along the route at short-walk intervals, a key feature that makes the place successful and vital.